What is a competency based assessment tool? A competency based assessment tool is a software or paper based process for assessing a person’s level of competence and identifying development needs. These tools can range from basic self-assessment questionnaires to sophisticated software that can amongst other things identify gaps in competence across a group of people. Below we describe the seven essential elements you need in a competency based assessment tool for it to be effective in an organisational context. But first, let’s look at why you need one. With 72% of organisations agreeing that competency management is critical or important to their business1, competencies are fast becoming the tool of choice for high-performing companies to manage performance development. Competencies can serve as a solid foundation for performance management. They are used by some of the world’s most forward-thinking, talent-hungry organisations. Google, Nike and American Express are among those now leveraging competency management to snap-up, engage and develop top talent, reinforce organisational values and drive business success. To benefit from competencies an organisation needs a process. 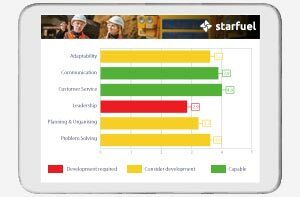 To implement and manage a competency assessment process such as this you need a tool. Using a competency based assessment tool people will be assessed against competencies. Your company may already have a set of competencies that it wants to assess staff against or it may be developing some. A good tool will support your existing competencies and will also provide a library of competencies to assist if you don’t already know which competencies you want to assess against. Ideally the tool will support competencies to be defined at different levels. For example, from novice through to expert. An advanced tool will also support the creation of role based competency templates. To make the assessment process easier a good tool will provide an online interface that guides a person through the assessment. It should provide all the relevant information a person needs to be able to self-rate or assess another person. Assessments can be done in a variety of ways. One is a simple self-assessment where a person rates themselves against a set of criteria. Some companies will involve managers in a person’s assessment or a person who is expert in the field in question. To support these processes a tool should enable these people to easily assess designated people using a friendly online interface. To increase accuracy and provide more useful feedback a good tool should support additional people contributing to a person’s assessment. This process is called multi-rater assessment or 360 degree feedback. On it’s own a competency based assessment does little. To be effective, people need to understand their level of competence and undertake learning to achieve a desired level of skill. A competency based assessment tool needs to provide reporting to help a person understand their current level of competence so that they can formulate an action plan to achieve their desired level..
A tool should be capable of providing learning suggestions to help a person formulate their development plan. The learning suggestions should be specific to individual competencies. To determine common strengths in a group and common gaps. This information may be critical for effective operational performance, workforce and succession planning. To identify common learning needs. If individuals formulate their own development plans in isolation companies are missing a chance to group together people with common development needs and also save money on any training. Over time a quality competency assessment process should show an improvement in competency levels and a reduction in gaps. In order to determine whether a competency assessment process is working optimally, a tool needs to support an analysis of assessment data over time. Interested in exploring a competency based assessment tool? Cognology’s online competency based assessment tool includes the seven essential elements described above. It is easy to get up and running with assistance from our friendly specialists. Find out more here.